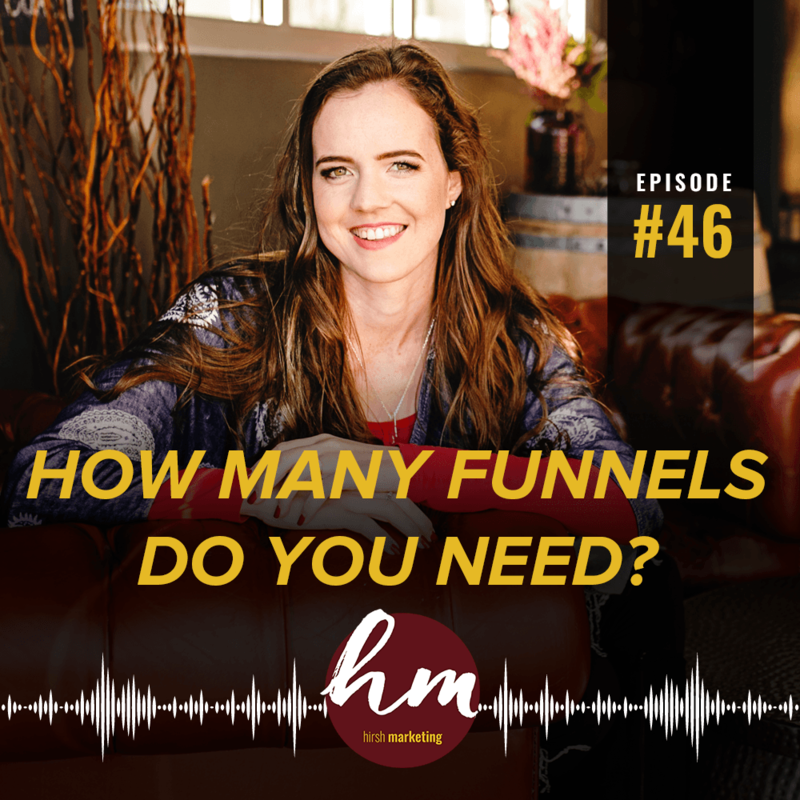 46- How many funnels do you need? How many funnels should a *successful* business have? How much ad spend does it take? How do you get started building out your Value Ladder? There’s a lot of misinformation out there (I know, because I hear the stories of overwhelm + failure all the time). So in this episode, I’m clearing up the confusion about the number of funnels you need to succeed, plus what to include and where to start building your Value Ladder. Tune in for one of my signature pep talks (filled with action items for the serious influencer! ), and then share your takeaways on IG stories! Tag @emilyhirsh for a shoutout. In today’s episode, I’m going to talk about how many funnels should a business have? This has been a theme in a lot of people I’ve talked to over the last couple weeks and events that I’ve been at and just questions that have come up in the audience. It’s just like, how many funnels should I have? How many products should I sell? I wanted to open up the conversation here because I think this is important. One of my core values and biggest takeaways growing my own business from six to seven figures is the importance of focus and the importance of really focusing on one thing and making that work really well, and then adding things in once something is super perfect. I was at an event, I was speaking at an event, and then we were doing round tables. I was answering questions at a round table, and somebody was asking about their value ladder. I know Russell [Brunson] and other marketers out there, they teach the value ladder, which I 100% believe in and believe there should be a customer journey value ladder. Here’s where I think there’s confusion. That is, that you need every step of that value ladder and all the funnels that go with it to start. This person was like, “Should I have a $297 coaching program, and then a $1,000 one, and then my high ticket $5,000 one? How do I tie them all together?” She was super overwhelmed talking about it because she really felt like she needed all of these offers, like all the levels of her value ladder and all of them ready to go before she could launch anything. My advice is, the answer to the question, “How many funnels should a business have?” There isn’t an exact answer, but I don’t think we should be priding ourselves in, “Oh, I have six funnels, and I’m running traffic to all of them!” Because, it’s just like if you have six businesses. They’re all going to be doing okay, and none are going to be amazing. As soon as you focus on one, it will blow up. It only takes one funnel to blow up, and the value ladder is usually not one funnel. If you have a $297 product and then $997 product, you’re probably selling them in different funnels. If you have a high ticket, you’re probably going to calls – different funnel, right? My advice is, have one funnel. If you haven’t perfected one funnel, meaning like it’s making a million dollars, and you don’t have to do anything in there from the delivery to the marketing, and it’s automated, and good, and your team has got it, and it’s profitable … then you can make another funnel. People might not like that answer, but that is really my opinion, and I think it’s overwhelming. Hopefully, it’s a relief to you guys because I know, I was at this round table, and my answer to her was like, well … first what I did was, I dug in to her audience. I don’t believe you can say like, “We’ll start with the $997 product because that’s what everybody is doing.” I dug into, “Who’s your audience? Who are they? What do they want? Then tell me about your product. Tell me about what you’re offering?” Because here’s what I can’t stand, is when people just create random offerings because they want to fill their value ladder. No! What do you actually want to sell? What is your offering? Build that first, and then we can attach a price to it. Don’t just say, “I think I could probably pull together these materials and have a $297 product, so my value ladder is complete.” That’s not how it works. Have your offering, what you’re good at, and what you should offer people, and how. What’s the best delivery? Is it a service, or is it a course? How is it delivered? Then you can decide a price, and that’s your offer. Just stick it on the value ladder wherever it goes, and then build the funnel attached to that, and perfect that funnel before you add any other funnel. Really, every business should have one funnel until it’s ideally making seven figures. You might have one off funnels every once in a while, like if you were to do a live event, for example, or if you have a live launch, and so that was different than your other automated funnels, and that’s fine. The key with that is that it better be attracting the same person because they will feed into each other. We have clients with six funnels. We have clients with live events, and high ticket, and “free plus shipping” funnels, like all in one, but they’re all working. And we’ve made them feed into each other, but also here’s the catch: anybody with multiple funnels, that means you need an ad budget for every funnel. If you come and say, “I have four funnels, and I have a $1,000 a month ad budget,” good luck! Because you’ll be splitting that $250 a month, if I did the math right in my head really fast, between all those funnels. That’s going to be impossible to make it do well. There’s a lot of times that we get on a strategy call with a client, and they bring us all these ideas, because you guys, if you’re listening, and you’re an entrepreneur, and you’re a visionary… You’re not short of ideas, and you’re not short of products that you could make, and content that you could make. That is not your problem. Your problem is probably focusing. When we get on a call a lot of times with clients, they’ll tell us about all these products, and funnels, and offerings they have, and we usually are like, “Hey, here’s our recommendation: This one sounds like your strongest. You’re most passionate about it. It’s like your signature offering. It’s like, the backbone of your business. We’re going to start here, build an amazing funnel to this, get it working, get it profitable, get it automated, smooth autopilot, and then we can add in this other one.” The benefit here is that you might have people who come into this one funnel who will also go to the next offering when you launch it, or that offering might be even better because it’s a lower price for them, or I don’t know… They will eventually feed into each other, but if you start with very slim resources because you have to spread them across multiple funnels from the beginning, meaning your time, your team’s resources, building and editing funnels, and then your marketing dollars – all those things will have to be sprinkled across all the funnels that you have, then you’re setting yourself up for a struggle, stress, and possible failure. My recommendation is sure, build the value ladder out. Like, “What’s my long-term vision for my company?” You don’t have to start selling all those products from day one. You may not even always sell, you may not sell them. You might have one that just takes off, and you ride that wave for a while. That’s your $1,000, or $2,000, or $10,000 offer. I don’t know because I don’t know your business. Everybody’s business should be different, but I thought it was interesting when somebody thought, “I need to fill my value ladder, because I need to fill it, and because everybody says I need one, and I need all of this to be able to start.” That’s misinformation, and I believe every business should have one solid, converting, automated funnel where their time, and energy, and team’s resources, and money goes into. Once that’s solid and profiting, you can add in other funnels. If you do this, I promise that you will see so much more success because you’re not going into it with very bare resources. I just see this mistake happen so many times, so don’t let it happen to you. Focus, focus, focus on that one funnel, perfecting that funnel, and you know what? It might be boring, you guys. You are a visionary, and you have ideas. If you have those ideas, I’ve said this before on the podcast, go and put all those new ideas into visibility content and value content that your audience can have. You can have always new things on that area, but perfect your funnel. Don’t throw [money] away at it. Don’t change everything about it. Perfect it, track it, optimize it, and then automate it. You’ll be so happy you did. Then put all those visionary ideas that you can’t shut off into your Step 2 of The Hirsh Process, which is visibility, brand awareness, value content. You can never have enough of that. You can put something new out every week, so put that creative juices into that, and then focus on your funnel, and your lead gen, and your sales until it’s at a seven figure funnel. You will be so, so glad you did that. If you want to work with Team Hirsh and want support on your high-level marketing, big picture marketing, as well as your Facebook and Instagram ads, go to HelpMyStrategy.com to apply to work with us. Thanks for tuning in, guys.